The Web of Science database may be intermittently unavailable this coming Sunday, April 10 due to systems maintenance. The maintenance window is 13:00 to 16:00 BST. There may be occasional outages to Web of Science throughout this time and it is expected that there will be two instances of downtime, each 15 minutes in length. They apologise to users for any disruption and inconvenience that may be due as a result of the required maintenance work. This is the first in a short series of blog posts looking at common questions which users of our libraries may have about using Primo, our resource discovery tool, when looking for materials for their study or research. Primo is the portal to our paper and electronic resources and can lead you to millions of different materials available here at the University of Aberdeen. In this post we will show how Primo can help you locate a particular book you wish to read, something you may have been asked to read for a class or maybe a book you have learnt about from your own reading. 2 – Once at Primo we would always recommend logging in so that you can link out to electronic materials and use all of the features available in Primo. 3 – You will need to enter your UoA username and password. 4 – Once logged in you will see your own name at the top of the screen. 5 – In this example we are looking for the following book: Saunders, M., Lewis, P. and Thornhill, A. (2012) Research Methods for Business Students. 6th edn. Harlow: Pearson. Select the Books+ tab to focus the search on books. Enter some details of the book and the family name of the first named author. 6 – Primo returns a list of 3 results and the title we are looking for is at the top of the list. Primo tells us on the right of the screen that there are 5 versions of this book. For more details click on View 5 versions. 7 – All 5 versions are now listed, each a different edition published in different years. We are looking for the 2012 edition and it is at the top of the list. Be sure to read the edition that you have been asked to consult as older editions may contain out-of-date information. To find out if it is possible to currently borrow the book select Availability. Two copies of this book, both currently On Shelf and available to be borrowed from the Heavy Demand collection on floor 1 of the Sir Duncan Rice Library. You are also provided with the Call Number to help you locate it on the shelf. You can book Heavy Demand books up to three weeks in advance so you can get the book when you want it. To do that select Heavy Demand Booking. 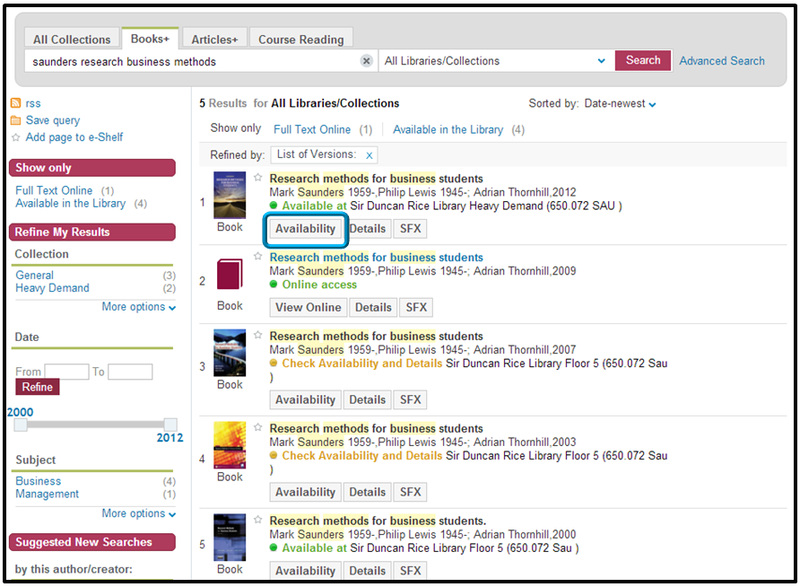 9 – Having already logged into Primo makes it easier to book library materials. Select the date you wish to reserve the book for and select Request. 10 – You will get a message indicating that the booking was succesful. You will be able to collect and borrow the book from the Heavy Demand area on floor 1 of the SDRL after 10.30am on the day you have reserved it for. It will be on the shelf at the Call Number given in Primo. 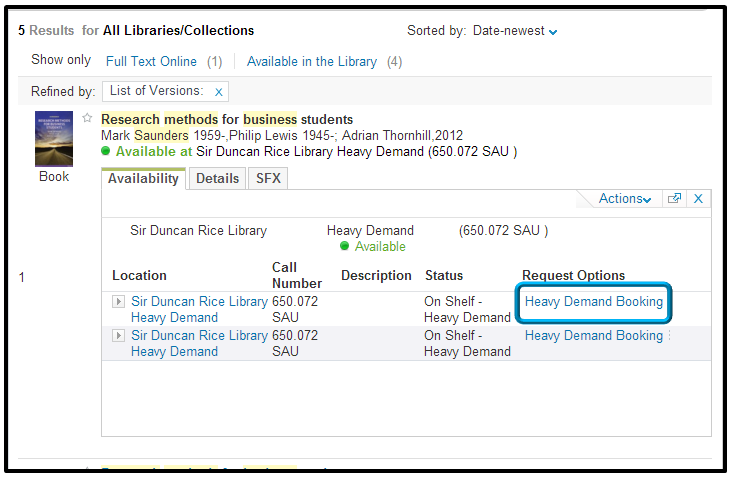 The collection of Heavy Demand books operates slightly differently in the Taylor Library, with requested books available for collection from staff at the issue desk in the library. The Medical Library leaves reserved Heavy Demand books on the shelves for collection. Click here for further details on reserving and booking library materials. Further information on using Primo can be found in our online library guide. To see our full range of library guides click here. Also, don’t forget that library staff are here to help you locate any materials you may be having trouble locating. There will be a slight disruption to the operation of Primo tomorrow morning, Wednesday May 27, between 9am and 10.30am, while an essential update to the service is carried out. Primo will still be available for searching, but the details concerning the current availability of books may not be totally accurate. Also, please do NOT use the alternative library catalogue during this one and a half hour interruption. Please accept our apologies for this brief, but vital, interruption.